When implementing e-Learning solutions, we club various factors like client's specific e-Learning objectives, learning patterns, e-Learning preferences, ease and likeliness to learn online, etc., to define one clear and enticing e-Learning implementation for their needs. Be it our ready-to-use e-Learning solutions, developing e-Learning modules from scratch, or the tip of the iceberg customizations, we provide end-to-end e-Learning solution implementation services to deliver the best for your organizational training needs. After the requirement analysis for creating e-Learning solutions implementation modules, we move on to a rigorous design process, to build successful e-Learning solutions. Our team of e-Learning developers and designers define integrated e-Learning modules to create the right custom e-Learning tool for all our client requirements. Before implementing our e-Learning solutions, we deploy the solution prototype, which helps our clients take well-informed decisions regarding training flow, usability, GUI, features, reporting, and so on, to make the whole process of developing e-Learning solutions more workable and successful. 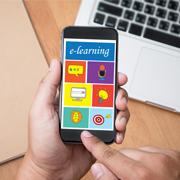 We test run our e-Learning solutions on sample participants and collect valuable feedback on their learning experience, usability, modularity, effectiveness and other O2I exclusive feedback pointers. This gives us major insights into redesigning or customizing the implementation of e-Learning solution for improved efficiency. We ensure that the e-Learning solution implemented for our clients is based on a robust design where post-build customization is easy and less time consuming. This provides client's an added advantage of making quick changes to their e-Learning solutions on the run. Our e-Learning solution implementations are handled by our expert team consisting of highly skilled instructional systems designers (ISD), web and application developers, training experts, content developers, creative artists and testers to give you a complete custom e-Learning solution. O2I promises you the best-in-class solutions, with modular and end-to-end custom e-Learning solutions at our disposal. Outsourcing e-Learning solutions implementation to us in India can help you train your professionals with the latest techniques and implementations in your domain, in less time and cost, with increased productivity. e-Learning solutions at O2I don't just educate; they inform about latest trends and developments, communicate knowledge effectively, train readers and improve their overall performance. Contact us, to learn more.